Dubai: Around 140 children from low-income families in Dubai are taking part in activity camps this summer through a local charitable programme called BOOST. In collaboration with Emirates Red Crescent, BOOST has organised the initiative to tackle the problem of children being confined to cramped indoor spaces during the summer months. “Every child deserves the opportunity to keep fit, healthy and active in the summer months and we understand how hard it can be for low- income, hard-working families to make this happen. This is why we want to ensure every child in the UAE has the opportunity to access affordable sports and activities while bringing the local community together,” said Tracy Fountain, the founder of BOOST. The new programme has secured spaces for 100 children aged between eight and 16 in seven different Dubai camps. They are Dubai Holiday Camps, Elite Football Club, Fitt Group, The Football Centre, IFA Sport, It’s Just Football and M&S Sports Services. School Transport Services LLC (STS) are also working together with New Balance to provide students with transportation to the summer camps. “Ensuring that children get to and from their summer camp safely is just as important as attending. That’s why STS will be providing safe, reliable transportation to and from every child’s activities during these hot summer months. STS is proud to support BOOST and be part of such a noble initiative,” said Col (Retd) M.L. Augustine, managing director of STS. All the camps have activities ranging from sports to science, including football, cricket, dodge-ball, hockey, basketball, Brazilian football, volleyball, football, cricket, rugby, and athletics, while many also offer swimming, arts and crafts, and wacky science. “Our initial aim is to accommodate a minimum of 100 children in camps this summer. With the support of our partners and sponsors our goal is to be able to support as many children as possible this year and for many years to come,” said Fountain. Attending summer camps during the 40-degree summer months are often not an option for low-income earners, who as a result have no choice but to leave their children indoors at home as it is too hot to play outside. For numerous children this can contribute to behavioural issues and can also cause tension within the family, she added. BOOST works in partnership with Dubai-based schools and charities to identify families in need of support. The initiative is looking for businesses to come forward to provide free services such as bus transport, free sports kits for the children and healthy fresh packed lunches and sponsorships. For more information on the programme, please visit www.boost.ae or contact info@boost.ae or call 05 65624721. 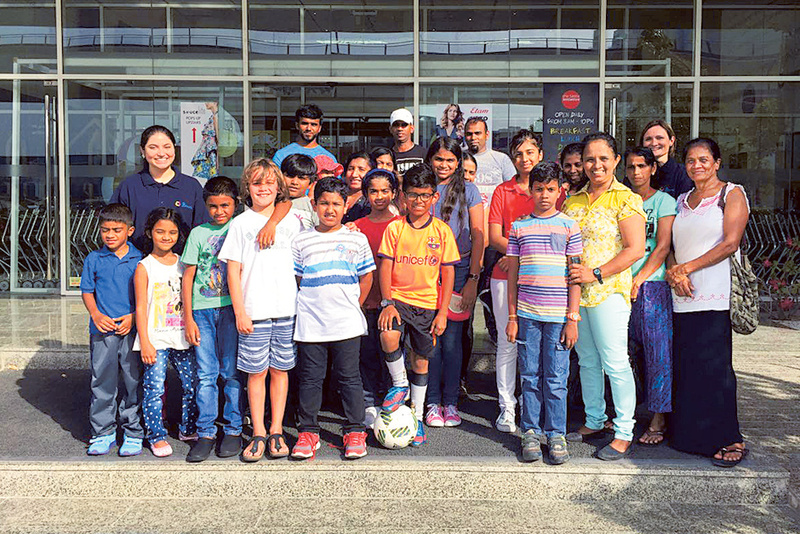 The idea behind creating the BOOST Volunteer Programme came about when founder Tracy Fountain helped single mother Shama Di Silva, from Sri Lanka, place her son, Chalana Denuwan Edirisingha, in a summer football camp last year. Di Silva, who is a housemaid, has been living in Dubai for 13 years with her nine-year-old son. Looking back at previous years, she said the summer months are usually a problem, as she spends her time working while her son is at home. “As it is very hot outside, sometimes over 50 degrees, he is unable to play outside, and has to stay indoors. Like many children his age, he loves to play and be active outdoors but in the summer, when he is off from school, this is just not possible. Even a trip to the park is hard as it’s too hot. There really isn’t much for him to do,” said Di Silva. She pointed out that Chalana’s experience at a summer camp last year had a positive impact not only on his sport skills, but also his personality. “He became a more sociable person and was once again a happy boy. This was because he was able to play with other children and take part in sports and activities that he really enjoys,” she said. Di Silva highlighted the importance of such charitable programmes that provide children with opportunities they never had. “Parents like me, from lower earning families, never get the opportunity to send their children to summer camps and it’s now wonderful to see this programme happen,” she said.